“Culture is key to what makes cities attractive, creative and sustainable. History shows that culture is at the heart of urban development, evidenced through cultural landmarks, heritage and traditions. Without culture, cities as vibrant life-spaces do not exist; they are merely concrete and steel constructions, prone to social degradation and fracture. It is culture that makes the difference.” (UNESCO, 2016). Culture which widely refers to values, beliefs, knowledge and wisdom has become recognized as a powerful source of sustainable development. Considerations for culture in sustainable development are indispensable for respecting and satisfying people before and after policy development and implementation processes. Culture and tourism can complementarily interact with each other as tourist destinations inevitably involve the interface of their rich and diverse heritage, art, religion and other elements that represent the unique characteristics of their daily lives. With its close-knit relation of culture to our daily life, culture not only reduces barriers to economic development for local communities through tourism, but also provides easier access to cultural differences for tourists. In 2004, UNCTAD read this trend, stating “if the 49 Least Developed Countries (LDCs) are taken together, tourism is the single most important source of foreign exchange earnings.”Utilizing the unique culture of a community, which is the great resource of tourism, can be a cost-effective measure of economic development with its less invested infrastructure compared to other industries. Despite the economic benefits brought by tourism, however, many countries have been experiencing the negative consequences of reckless development, including the degradation of cultural and natural heritage, loss of cultural features and unequal distributions of economic gains. The need for well-designed plans for sustainable tourism has been highlighted to ensure the long-term economic, environmental and social benefits through tourism. Cities, in particular, which have been dramatically transformed amid global urbanization, need to recover its own characteristics, placing culture in the center of urban planning as well as tourism management, in order to achieve balanced development in the long term. This workshop, therefore, provides a venue for participants to understand the complex relation between culture and tourism through various lectures and group activities. Best practices on cultural tourism will be presented, offering opportunities to explore well-designed tourism development cases around the world. There will be sessions to discuss good policies and practical cultural projects in line with the UN SDGs. Finally, the workshop will help local actors effectively develop relevant policies, promoting and enhancing their cultural advantages and diversification for the social, environmental and economic benefits in the long term. · Provide an opportunity for the local governments and cities in the Asia-Pacific region to exchange cultural tourism policies and best practices through city- to-city cooperation. · Promote a learning atmosphere between cities and establish a strong network which can be utilized after the workshop. · Offer a venue for knowledge sharing and discussion and motivate participants to implement sustainable tourism policies, placing culture in the center of the policy. · Understand the cultural tourism trends and policy development in the context of 2030 Sustainable Development Agenda. · Utilize the lessons learned from the cases of cultural tourism policy implementation in various regions. · Have a basic understanding of cultural tourism and deepen the ideas of sustainable practices for regional/city/local development through local people’s participation. · Understand the economic impacts of cultural tourism on the regional development, recognizing the importance of environmental and cultural conservation for sustainable tourism. ** Participants should have sufficient command of both written and spoken English. · Submit necessary documents on time, i.e., application forms etc. · Complete and submit pre-training assignment, i.e., case study description etc. · Actively participate in the training program. · Be fluent in written and spoken English. ** Late application will not be accepted. · Application without the required documents will NOT be considered. · Participation is subject to approval of the application by UNITAR CIFAL Jeju/JITC. · Selected applicants will be notified individually. · UNITAR CIFAL Jeju/JITC provides partial airfare to Jeju, Republic of Korea according to the Cifal Jeju's travel reimbursement policy below. 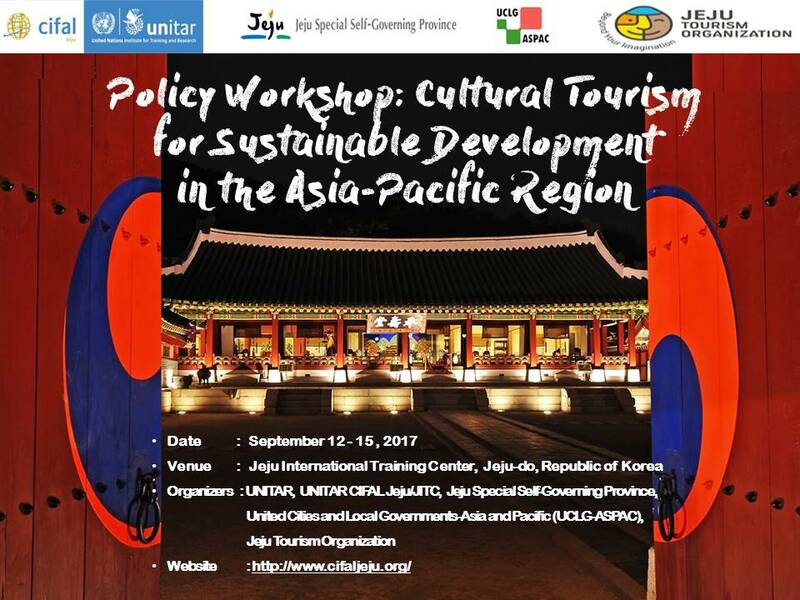 · Local expenses (transportation, accommodation and meals) during the workshop will be covered by UNITAR CIFAL Jeju/JITC. · All other expenses (local transportation in their country, visa fees) are the responsibility of the participants. UNCTAD (2004), World Investment Report 2004. The Shift Towards Services. United Nations Conference on Trade and Development, Geneva. The UNITAR-developed CityShare methodology aims at optimizing peer learning between local officials. It consists of various processes of self-assessment, distillation and transmission of experiences and good practices. It is also composed of several tools which provide a common framework for the evaluation of experiences made by the participating cities and countries and offer a common language for the exchange and assimilation of contextualised experiences, as well as a roadmap for action and progress.